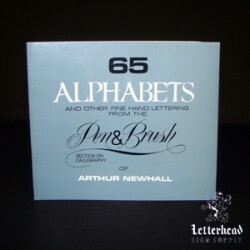 Buy Alphabets for Lettering-Book for Sale here has 65 alphabets for Hand Lettering by Pen or Brush. Author Art Newhall is responsible for creating one of the most spectacular letter styles ever created known as "Cartoon Casual" as well as "Modern Script" of the 1940's and 50"s. Alphabets for Lettering-Book Subject matters covered are Basic Form, Caption Display, Cartoon Display, Modern Script, Spencerian Script, Roman Style, Unique Styles, Calligraphic Lettering, Black Letter, Logo Design, Letters in Action and Lettering Tools. As I thumb through Alphabets for Lettering-Book, there's a 2 page bio on the author and a short bio at the end, but the middle is full of visual, mainly different very nice classic fonts. The last update of this book was in 1996. These are great for inspiration and character when designing. Paperback printed in black and white with 107 pages. Click here for more information and pricing on Alphabets for Lettering-Book.